Freedom Home Care and Medical Staffing provides in-home senior care serving Oak Brook, IL and the surrounding Chicago land areas. 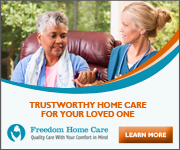 Here at Freedom Home Care and Medical Staffing, we provide only the best in-home senior care for the people of Oakbrook, IL. Our services range from in-home senior care and Alzheimer’s care to additional services including alternative therapy and arthritis care. Our caregivers go through extensive training and background checks in order to be the leading Oak Brook in-home senior care facility. FHC focuses on providing our clients with quality, individualized care for each client. We understand how important superior care is for your loved ones, so we guarantee that every one of our caregivers are properly trained and educated in order to offer a safe and comfortable environment for our clients and their families. We also offer a 24-hour on call staff because we know that help can be needed at any time of the day. If you are searching for Oak Brook senior care for your loved ones, give Freedom Home Care and Medical Staffing a call. We would love to help create a specialized care plan that is right for you and your family. Oak Brook, IL is located only 19 miles west of downtown Chicago but first began as a small village in 1958, named after the Oak Brook Civic Association. The man who had a large part in incorporating Oak Book, IL was Paul Butler, one of the main civic leaders in Oak Brook during that time. His love of sports influenced the creation of the Oak Brook Sports Core that includes a golf course and other recreational facilities. With a population of only 7,883 people, Oak Brook, IL still stands as one of the wealthiest villages in Illinois. It is also home to the popular Oakbrook Center shopping mall and many other retail spaces.